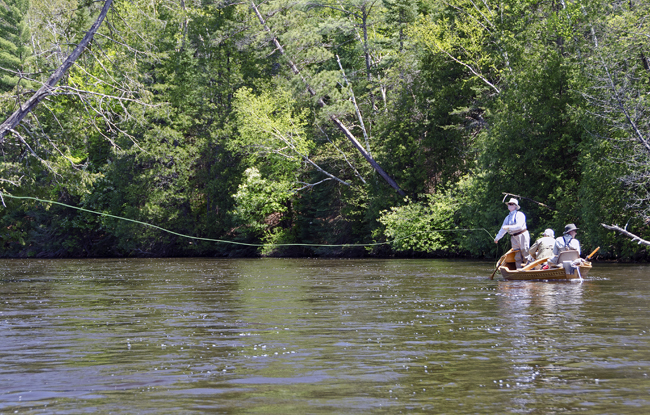 long-distance nymphing covers water few anglers reach. Among the many blessings in my life has been the opportunity to fish nymphs with guides who specialize in the art (and if it isn't art, it's definitely craft, skill, talent, technique, and some other artsy nouns) and with the authors of books on how to fish nymphs. That's provided me valuable insight into how standard indicator nymph fishing works—the mechanics, the rigs, the fly patterns...—plus, after a few decades at the practice, I've figured out some things on my own. So now, I pass what I've learned along to you, thus, blessings shared. I feel good about that. Here's a good spot to mention that while there are lots of effective ways to fish a nymph in a trout lake, that's not the focus here. Here, we'll look at fishing nymphs in trout rivers. Though I've experimented with and have spent some serious time at most of the nymph-fishing variations—including hopper-dropper and Czech nymphing and the Leisenring Lift, among others—the specific strain of nymph fishing I understand best is good old garden-variety standard indicator nymph fishing. As I see it, that's a good thing—standard indicator nymph fishing is certainly the most versatile approach of them all. a single fly up to three flies on the rig. Nearly everything you can do with a nymph in a river you can pretty much do with plain old standard indicator nymph fishing. I'm not suggesting for a moment that all the other established new and old nymph-fishing methods are inferior—on the contrary, they can be more effective than indicator fishing when conditions for them are right. I guess it all boils down to this: if I had to limit myself to one method of nymph fishing, no contest, standard indicator nymph fishing would be my clear choice. And, in fact, it's what I’ve chosen to focus on in this article. So, you can Czech nymph to your heart's content (which happens to be, like all forms of fly fishing, good for your heart)—but you'd better bring strike indicators with you to the river and you'd better know how to use them because if that river has any real size to it at all, you'll need to use them. When you do use strike indicators, here are some tips, tricks, strategies, and rigs to raise your own trout-river indicator-fishing to a high level. Which, of course, means more hook-ups, more trout—more fun. rigs to raise your own standard indicator nymph fishing to a high level. For years I was in a standoff with the Duncan Loop Knot. Yes, it worked, and yes, I felt it freed a fly to really come alive in the water, but no, I didn’t like the knot—I didn't like it one stinkin' bit! The problem was, and is, that the Duncan loop closes up on every fish. Sometimes it closes up, well, just to annoy me, I guess. Some fly fishers like that it closes up. You already know where I stand on the matter. The standard loop knot today is the mono loop knot, also called the “non-slip mono loop knot”—non-slip, it doesn't close up! It's no cinch to tie, but how many fly fisher's knots are? It's tying is manageable. And if you don't like the mono loop knot, there are now other loop knots that also don’t close up to choose from: the Homer Rhode loop knot, the Rapala loop knot (a sort of mono loop knot with an extra step at the end), and probably a couple I've not seen. Go ahead, try one or two, pick one. A nymph is free to really swing and shimmy and come to life when it's tied on with a loop knot. The knots I used to use for tying on my nymphs, such as the improved clinch and my own Skip's clinch, locked tippet and fly together as though they were glued. 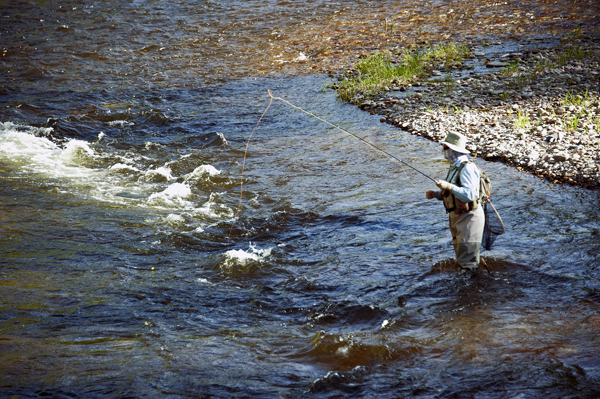 But you can't beat the way a nymph jiggles and tumbles on a loop knot—no longer is a nymph’s action in the currents limited by the flex of the tippet to which it's tied. Yay! by the flex of the tippet to which it's tied. This means that if you trust the opinions of a lot of sharp fly fishers who believe that fluorocarbon tippet is close to invisible in water, you can go about as heavy on tippet for your nymph fishing as you like and—thanks to that loop knot you'll now use—your nymph will still be free to shimmy in a way that pleads for a ride into a trout's mouth. 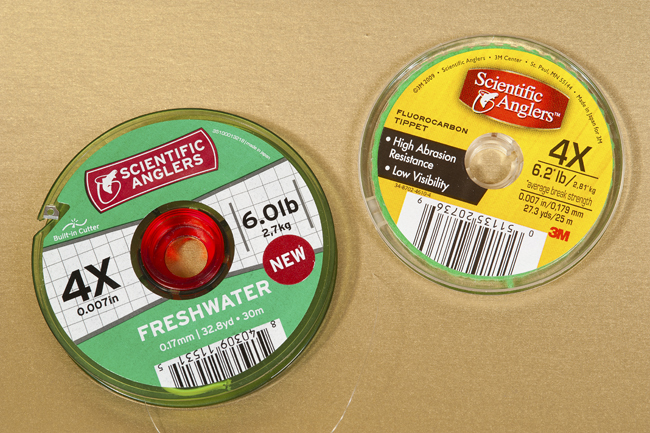 Fluorocarbon costs more, sinks faster, “may” be less visible than standard tippet. Fluorocarbon: low visibility, high price. All things considered, though, the cost of fluorocarbon tippet is probably only a fraction of what you pay for a fishing license, waders, rods, travel, lodging, and the rest for a few fishing trips. Is fluorocarbon really almost invisible in water? You should ask the experts in the field of trout vision, light refraction, etc. and etc... I'm no expert on any of that. There is an exception to the loop-knot rule, and here it is: in a trailer-nymph (with a nymph streaming off a foot or more of tippet tied to the bend of the top nymph's hook) I like to use a conventional knot (improved clinch, Skip's clinch) to tie on the top nymph. 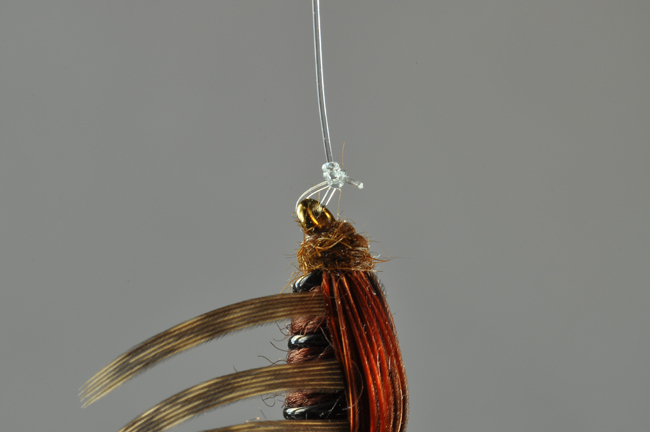 I don't expect that top nymph to do much underwater wriggling with something like a kite's tail (the trailer nymph) dragging on it, but during a cast I don't want it hinged and free to make the sort of tangles in tippet that nymph rigs like to make. The strike indicator must become your world—block all else out of your mind and sight. Really focus on your indicator. A strike indicator can shout—that happens when a trout gives it an angry yank under water—but often, an indicator merely whispers. It stalls, a little, it twitches, a little, and the fly fisher waiting for the dramatic indicator dive misses one take of the fly after another. ...often, an indicator merely whispers. It stalls, a little, it twitches, a little, and the fly fisher waiting for the dramatic indicator dive misses one take of the fly after another. My friend Rick Hafele, the author of Nymph Fishing Rivers and Streams, likes to poke around in rivers while wearing a wet suit, looking like a skinny seal with a snorkel. Once he slipped in at the tail of a run to watch the nymphs our mutual friend Dave Hughes (author of Nymphs for Streams & Stillwaters) drifted through and to see what the trout did. they took Dave's nymph a lot. he set the hook in only a few of those trout. The point is, you have to watch your indicator so intently that you note every jiggle, every hint of drag, every nuance, and when you detect any of this—you set the hook. That's correct—every time the indicator goes out, make a hook-set at some point during its drift. Finding a reason to react when the indicator seems to float naturally and complacently downstream means you stare at your indicator the way you'd stare at a suspicious mole when you've a family history of skin cancer. As Rick sees it, and I agree, there's got to be something in every drift that could just possibly be labeled at least slightly suspicious. This means, of course, that you're noting every nuance, every single movement of any kind in your indicator and even every lack of movement. Rick's exercise will fine tune your standard indicator-reading chops. This is the end of Standard Indicator Nymph Fishing Part 1. In Part 2, Skip talks about other deadly techniques that are important to keep in mind when you fish with nymphs.